← SkyView V3.1.13: SkyView-in-a-Jar bug fixes. SkyView version 3.1.14 has been released with a change that affects FIRST survey images. It was brought to our attention that some FIRST images generated using SkyView differed from images generated via the FIRST web server. We investigated and found that the files we created to describe FIRST data contained some older FIRST file names. These older files were being retrieved to generate FIRST images instead of newer reprocessed data files. We have updated out FIRST data description files so that only the latest data files will be used to generate FIRST images in SkyView. This entry was posted in Discussion, releases and tagged bugs, FIRST, releases. Bookmark the permalink. Which camera used to capture this photo? 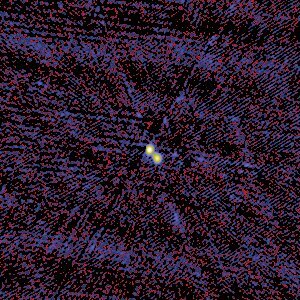 This image is from the VLA FIRST (Faint Images of the Radio Sky at Twenty-centimeters) project. If you still have problems let us know. Thanks for alerting us. Thanks a lot Laura. BTW, is Tom still around? I see that you seem to have taken over all this stuff. What’s he up to? I monitor your blog, It is perfect. thanks so much.